I don't often recommend apps in this blog. There are some really good iPhone apps: Awesome Notes, Reeder, Tapatalk, Tweetdeck, News360, etc. I just can't stop talking about Waze. I learned about Waze from a conversation with a colleague. She told me about this really good free GPS app to help a driver find their way around town. I asked if there is a Malaysia map and she said yes. 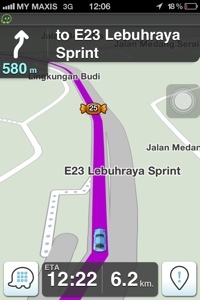 So I was expecting a huge download only to realize that Waze is really a small foot print. Being skeptical, I tried it out. And I was pleasantly surprise! This is a true GPS. Very accurate. Even with a proper lady voice over at the appropriate point during the drive. I drove from Bangi back to PJ and it just works. In fact, it gave me 3 routes and I chose the fastest. It was able to take me back via Sg Besi road through Desa Waterpark into Federal Highway and Penchala Link. I was impressed. But it is not just any GPS. In Waze, there is a community of users. As you drive, you see little icon in the road. See screenshot above. Those are users of Waze. New users looks like baby with pacifiers. As you use it more, you unlock new icons and can set mood.. LOL.. say, you are frustrated with traffic jam. Set your mood. 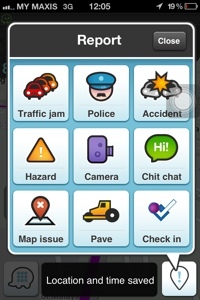 Waze, like Foursquare, has badges. As I drove 20 km, a new candy appear in the road ahead. Taking it unlocks a badge. You can quickly do traffic report. Whether there is an accident, a jam, traffic police or cameras. One tap and it will mark in the map for other users to see. So the users have intelligence especially useful if there is a police roadblocks. Ha ha. This screenshot shows some of the users with mood. 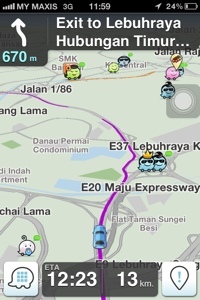 I am surprise to see so many people using Waze. I think it must be a really popular app among Malaysians! Lastly, when you are planning your route, Waze gives you alternate routes. You can look at these and see which routes have jams. 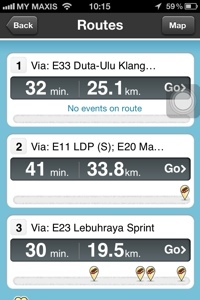 From the screenshots below, one of the 3 routes have multiple traffic jams. Amazing eh? 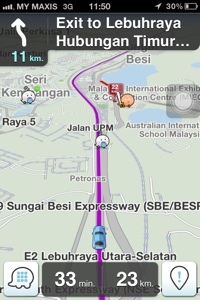 Waze works natively on iPad too!